Roast uncovered, or loosely covered with foil. If you choose to baste your turkey, limit the number of times you open and close your oven (once per hour is sufficient). Turkey is cooked when the meat thermometer reads 170°F (77°C) for an unstuffed turkey, or 180°F (82°C) for a stuffed turkey and the juices run clear. Insert meat thermometer in the thickest part of the inner thigh, but not touching the bone. When roasting, any stuffing placed in the cavity of the bird should read and internal temperature of at least 165°F (74°C). 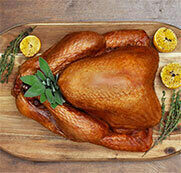 Remove the turkey from the oven when cooking is completed and let stand 20 minutes to allow the juices to set. *cooking times approximate at 350°F (177°C). Cooking times may vary depending on: the temperature of the bird going into the oven, the accuracy of the oven’s thermostat, how many times the oven door is opened during roasting, the type and size of roasting pan used and the size of the turkey in relation to the size of the oven. Download our Cooking Times quick fact sheet. The Turkey Farmers of Canada recommend that consumers check with their manufacturer as to how much faster and hotter their oven might be compared to a conventional oven. Generally speaking, convection oven cooking temperatures should be 25-50°F (3.9-10°C) lower than conventional oven temperatures to prevent overbrowning due to surface drying. Convection cooking does typically cause greater moisture loss in turkey. The result of roasting a turkey is the same in conventional or convection ovens in that the turkey is done when the endpoint temperature is reached. Your turkey is done when a meat thermometer inserted into the thigh reads 180°F (82°C) for a stuffed turkey or 170°F (77°C) for an unstuffed turkey. The drumsticks should also move easily in the joints at this point. Avoid overcrowding in the oven when roasting in a convection oven as crowding may inhibit air circulation and slow cooking. Prior to cooking, insert stem of oven-proof thermometer (stem will need to be at least 4 1/2″ (11 cm) long) into the thickest part of the inner thigh meat, not touching thigh bone. OR near end of cooking, remove from heat and insert instant-read thermometer stem or fork thermometer tines into inner thigh meat (as above). If stuffed, check stuffing temperature by inserting thermometer stem into centre of stuffing. Always wash the tongs, plate and thermometer stem used in checking partially cooked meats/poultry before using again.